I was lucky enough to manage to snag a year long Glamour Doll Eyes OTM, so I am happy to say I will be reviewing it all 12 months this year! It's very exciting, considering how difficult it can be to get a subscription, and that I no longer have to worry about it until next January. This is the first month that the OTM has moved to a new site, and the format of the subscription has changed a little. There were three pieces of taffy included, but I couldn't help myself and ate two before I took the photo. I noticed that the taffy colors corresponded with the shadow colors this month as well, so that was a nice touch. You may also notice the little anchor charm, that was in the bag as well. I'll have to figure out a cute craft idea to use that for! Shipping - The OTM will ship between the 10th and 14th of each month, and mine arrived 2 days after it shipped via USPS from Nevada to California. 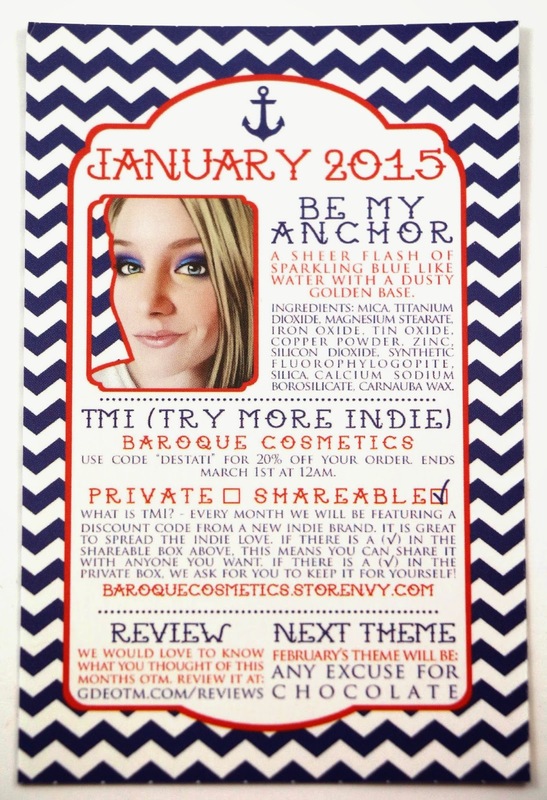 Shout out to my friend Kelly, whose beautiful face graced the info card this month! You can see the info card has changed a little this year. There's a clear theme every month, a TMI (Try More Indie) discount code that is to either be shared or kept private for your use only, and a sneak peek at next month's theme. I haven't tried Baroque Cosmetics yet, they've been on my list of places I'm allowed to shop from if I have a discount, so this seems like the perfect time! 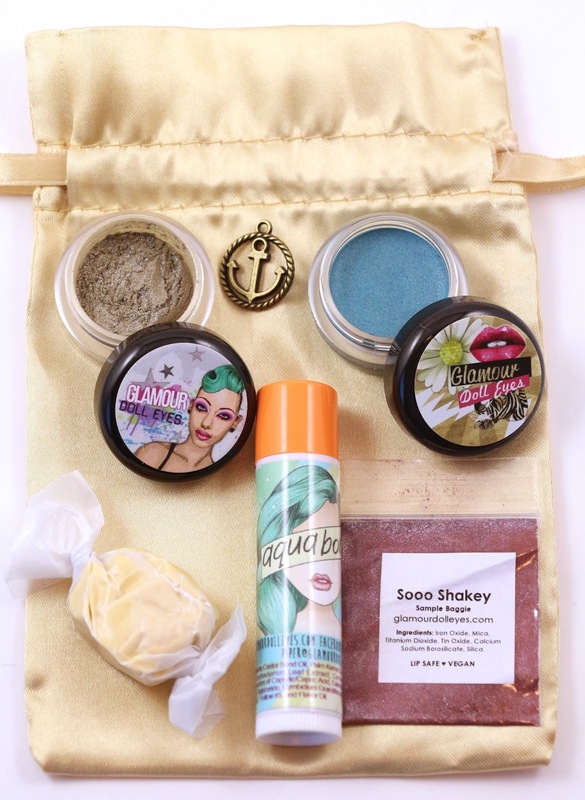 I love this addition to the OTM this year, even if we don't get to try one of the Try More Indie products, I love that there's a discount code because I will probably try to use them all. Hopefully, it will encourage other brands to agree to be in the subscription each month, or at the very least provide a discount code. 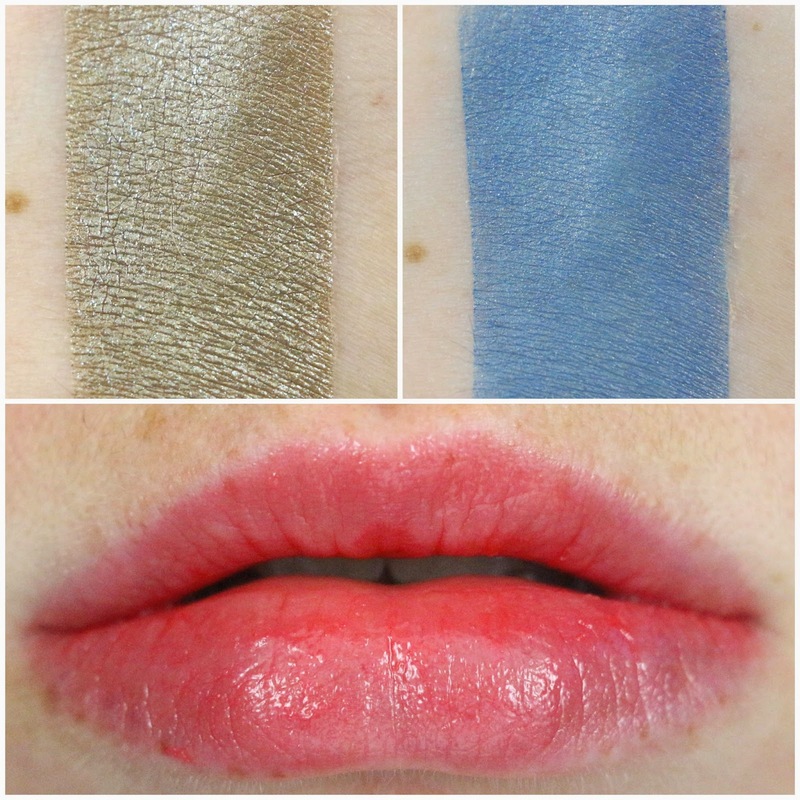 Be My Anchor - "A sheer flash of sparkling blue like water with a dusty golden base." This is the main shadow this month, and it's so pretty! There are blue sparkles all throughout, and it almost has a blue sheen as well, which was hard to capture with a camera. It reminds me of Baking Season, which was the limited gift with purchase shadow for December, except a little more golden in tone. Sailing Away - "A deep royal blue base with a soft coral reef blue overlay. It is finished off with an anchor golden shimmer sheen." This is a new product for Glamour Doll Eyes, it's a cream shadow, and it says to still use this over primer so I did for the swatch. 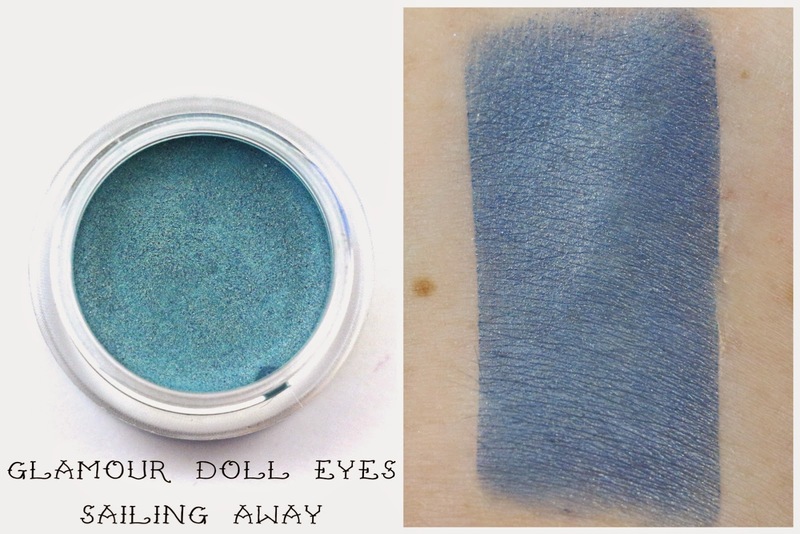 It doesn't have quite as much sheen as the regular loose eyeshadows do, but it went on very creamy, and I think it would work well as an eyeliner as well. A little birdie told me this looks amazing with Outtie 5000 over it...which I totally need to do as soon as possible! 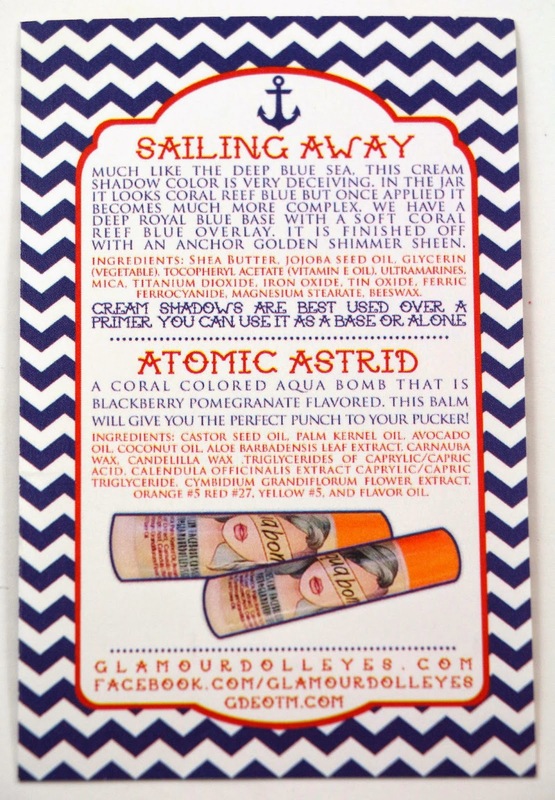 Atomic Astrid - "A coral colored aqua bomb that is blackberry pomegranate flavored." It's a tinted lip balm, and I love the shade and flavor of this one! 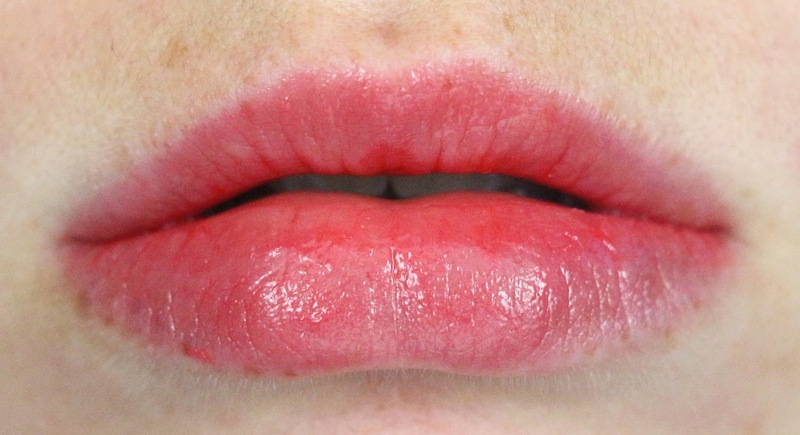 It gives just a slight coral wash tint to your lips, and it feels very glossy. I have heard a few people's tubes weren't advancing, but mine worked just fine. 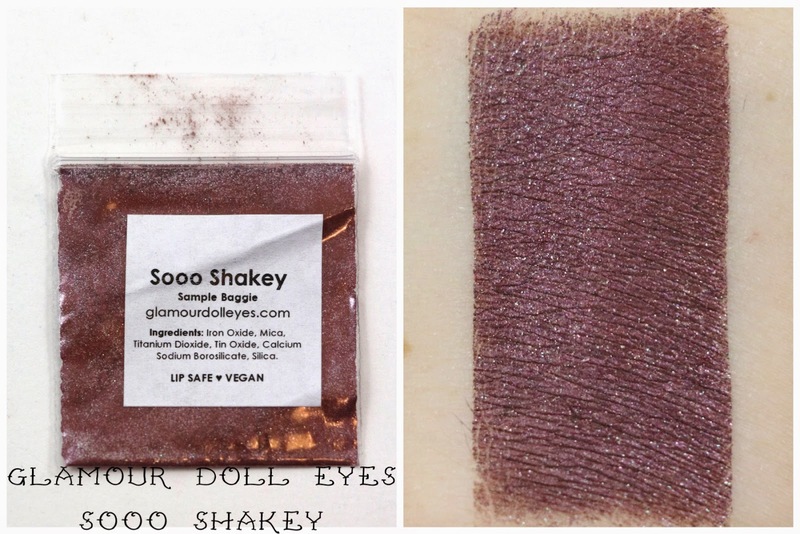 Sooo Shakey - "A cherry brown with a purple sheen and holographic sparkle." This was the bonus sample this month, which everyone got a random sample from the new Customer Appreciation shadows that just released on the 12th of this month. I love this shadow, I can't wait to get this and the rest of the Customer Appreciation shadows soon in jar form. I think the description is just perfect for this, it totally reminds me of a cherry truffle or some kind of decadent dessert. Overall, this month's Glamour Doll Eyes OTM had a total value of $16.25, which is pretty good considering I paid $10. I really liked everything we received this month, along with the new format of the subscription. I'll definitely be using the discount codes we get each month, and the info card and theme are very cute. 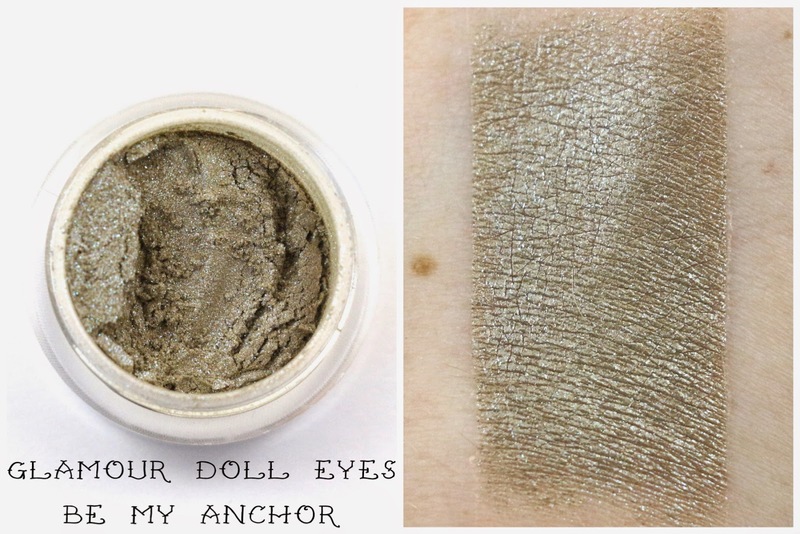 I love the main shadow this month, Be My Anchor, and it was fun trying the new cream shadow product. I also like the tinted lip balm we received, I'll definitely be throwing that in my purse when I want a little extra color. 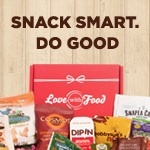 And I absolutely loved the bonus sample I got, I'll be needing a jar of Sooo Shakey stat! It's hard to pick a favorite! I'd have to say my favorite out of the normal OTM products was definitely Be My Anchor, I think that will look good in a variety of looks. Customer Service - I did not have to contact customer service regarding any problems with my subscription this month. I will note that I had an outstanding order I placed a few days before ordering my OTM, and Vanessa included it in the package with my OTM this month, which was great. Overall Satisfaction - My favorite product this month was Be My Anchor. I'll of course be continuing my subscription for the rest of the year, and I can't wait to see what's in store for the OTM! Any available subscriptions go up on the 8th of every month, February will be a lottery. Next month's theme is "Any Excuse For Chocolate"!